Moons with subsurface oceans are all the rage these days. There’s Europa, Titan, and just recently Enceladus joined the short list of moons that likely harbor large amounts of subsurface water. Jupiter’s moon Ganymede – the largest moon in the solar system — has long been a member of this club. The idea of this moon having water deep within its surface first “surfaced” back in 1970, and in 2000 after the Galileo mission flew by Ganymede, data confirmed the moon’s ocean, and showing it extends to depths of hundreds of miles, with additional evidence of salty seas. Now, a new study says that the configuration of this moon’s interior might be more like a club sandwich, according to Steve Vance of NASA’s Jet Propulsion Laboratory, who led the research. 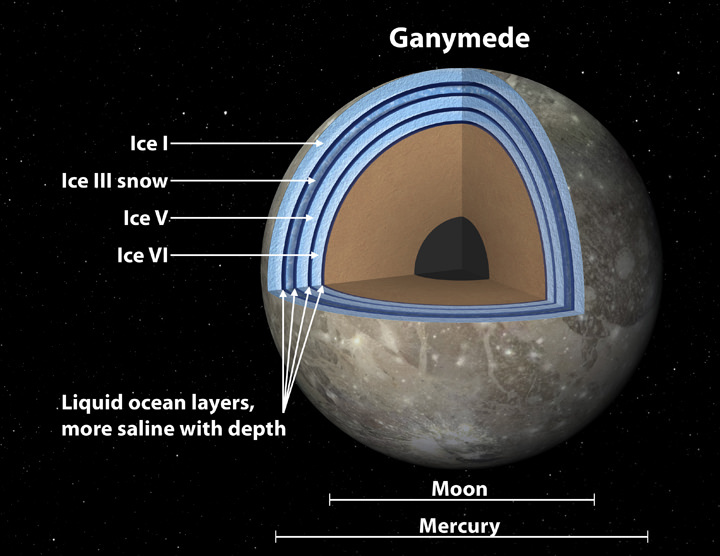 “Ganymede’s ocean might be organized like a Dagwood sandwich,” Vance said in a NASA press release, with ice and oceans stacked up in several layers, as in the graphic above. The results also support the idea that primitive life may have possibly arisen on this icy moon. This layered look was actually proposed last year by Vance and his team, and this latest research is based on theoretical computer modeling, where areas previously thought to be layers and lumps of just rocks and ice in Ganymede’s interior are actually layers of ice, water and rock. Usually, places where water and rock interact are ripe for the development of life, scientists say. For example, its possible life began on Earth in bubbling vents on our sea floor. The model computed by Vance and his team gets complicated when the different forms of ice are taken into account, which can cause varying amounts of pressure. This can change the whole dynamics of the moon’s interior. If the lightest ice is on top, then the saltiest liquid is heavy enough to sink to the bottom. As the oceans churn and cold plumes snake around, ice in the uppermost ocean layer form in the seawater. When ice forms, salts precipitate out. The heavier salts would thus fall downward, and the lighter ice, or snow, would float upward. This snow melts again before reaching the top of the ocean, possibly leaving slush in the middle of the moon sandwich. And if the first layer on top of the rocky core is salty water, that’s even better. You can read more about their modeling here, and the research appears in the journal Planetary and Space Science. We’ll add a link to the paper when it becomes available. Hmm…. saltwater is electromagnetically conductive. Ganymede’s orbit within Jupiter’s powerful magnetic field must create some interesting chemistry? At the very least there is a huge ground plane potential between the density layers. A very BIG capacitor? Sink conductors into the ice for power? See the report titled “Habitability of icy moons” at the website of the U. of Vienna, where four models or “scenarios” are described (http://www.univie.ac.at/EPH/exolife/icymoons.html). Obviously they’re alluding to mere germs like the terrestrial “extremophiles” (heat-, cold-, salt-, pressure- or acid-loving bugs). The existence of bodies of water like Lake Vostok, far below the surface in the Antarctic Continent, is what encourages astrobiologists, because they’re like miniature icy-moon oceans. Far more exciting is the similarity between the Big-Mac structure shown in the illustration and my own, open (no bread at the top) quasivegetarian Big Macs on rye bread. INSTRUCTIONS: Place a slice of tomato on the buttered bread, then a slice of cucumber, a slice of radish, a piece of scrambled egg with a few drops of soybean sauce on it and, finally, the big cherry on the cake, namely, a dollop of avocado (alligator pear), in such a way that it all fits in your size of mouth, which is unlikely. In most cases you’ll have to take a first bite, being careful not to drop the remainder all over the floor. This remainder might have to be reconstructed by adding some more of the aforementioned ingredients. While chewing, throw an olive into your watering maw, or some other pickled morsel, and take a sip of vinegar (acetic acid, unless it’s apple cider vinegar, which is malic acid and will make your body alkaline, as citric fruit do, and do away with the wicked “Helicobacter pylori”, AN EXTREMOPHILE, in your belly and help you get rid of your gastritis). Prepare as many such bite-size towers as your entrails can hold, one after the other. You won’t need much more than that (an orange, maybe, or a peach, and ramen noodles, some popcorn, potato chips, assorted nuts). PLEASE DO NOT ADD TUNAFISH. (Smoked herring is best.) They keep drowning hundreds of thousands of porpoises (dolphins), sea turtles and sharkies every year. The “dolphin-safe” label is WORTHLESS since the new nets haven’t stopped the massacre. All they do is let just a few innocents slip away and avoid being massacred. The authorities are aware of this and are collaborating with the big companies by misleading consumers. If you refuse to pay attention then you’re no better than the Japanese, the Icelanders and the Norwegians who go around butchering the whalies out there. Thank you for contributing to the habitability of planet Earth. Actually, it’s far too late to save it now, but let us go down the drain with DIGNITY.